Metro Manila is the metropolitan area surrounding the Filipino city of Manila - it also happens to be the setting and title of one of 2013's best films. Perhaps unexpectedly directed by British BAFTA and Oscar nominated filmmaker Sean Ellis, this intense foreign language drama explores the trials of an improverished family who face up to the harsh reality of inner-city living. Seeking to escape the poverty of the rice fields, Oscar Ramirez (Jake Macapagal) takes his wife and daughters to the big city. Almost immediately, however, they find themselves in a destitute situation, innocent yet naive victims of the locals. Despite the setbacks that leave the family living in a shack with no food, Oscar eventually manages to find suitable employment as an armoured truck driver - a hazardous but financially secure position. Oscar is taken under the wing of the experienced Ong (John Arcilla), and his wife (Althea Vega) also finds a job in a seedy bar. Things start to look up for the Ramirez family but all is not what it seems, and both Oscar and his wife find themselves in desperate situations. The morality and mortality of the Ramirez family's circumstances take the film from an involving migrant drama into the darker realm of crime thriller. 'Metro Manila' won the Audience Award following its premiere at Sundance Film Festival earlier in the year, and deservedly so. There's something of a Greek tragedy to 'Metro Manila', aided by the superb sense of foreboding which is slowly developed through the film and delivered quite magnificently by the actors, Ellis, and co-writer Frank E Flowers. The pace and occasional clichéd element may turn off some viewers but 'Metro Manila' is tremendous value otherwise. 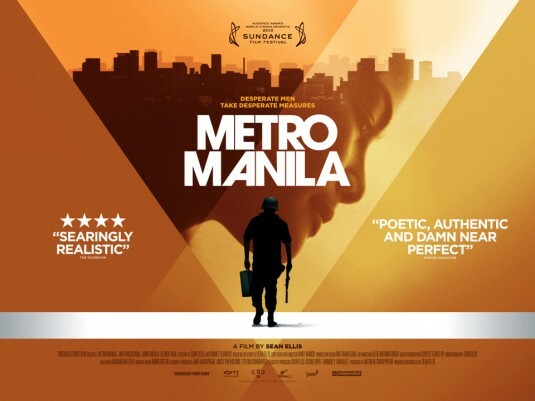 'Metro Manila' is out in UK cinemas on Friday, through Independent.